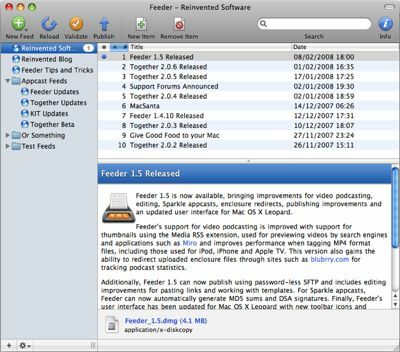 Reinvented Software has updated Feeder, an RSS editor for creating news feeds, podcasts and appcasts. improvements for tagging MP4 video files, item editing and Sparkle appcasts. For podcasters, Feeder includes full support for the iTunes RSS podcasting extensions, drag and drop episode creation, an iTunes Store preview and the ability to tag all popular podcast media files. Feeder can publish feeds and associated files via FTP, SFTP, .Mac and file export. In Feeder 1.5, video podcasting support is improved with thumbnails using the Media RSS extension. This version also improves performance when tagging MP4 format files, including those used for iPod, iPhone and Apple TV and has the ability to redirect uploaded enclosure files through sites such as blubrry.com for tracking podcast statistics. Additionally, Feeder 1.5 can now publish using password-less SFTP and includes editing improvements for pasting links and working with templates. For Sparkle appcasts, Feeder can now automatically generate MD5 sums and DSA signatures for software updates. Finally, Feeder’s user interface has been updated for Mac OS X Leopard with new toolbar icons and sidebar. More info at the Reinvented Software site. do you know anything like this for windows or linux? thanks!